Leaves is made from Oakshott cottons from the Ruby Reds range, and black linen for maximum crinkle and contrast with the Oakshott (I didn't prewash the fabrics so it was quite a relief when it survived a wash!). It's often difficult to photograph shot cotton and capture the richness of the colours, but this is how they glowed in the late afternoon light. The leaves are all different. They were foundation pieced in halves, joined together and appliqued to panels of linen, then machine quilted - some more closely than others. These Oakshotts are all shot with red so that was the obvious choice for a quilting thread which would go with all the colours. I used a lovely shiny 28 weight Aurifil cotton for extra definition. Once I joined all the panels together I backed the quilt with Ikea nummer fabric - I love the white against the black - and hand quilted the linen background with large kantha-style stitches in Guttermann top-stitching thread. I tried using perle first, but didn't like the effect as it looked too heavy. The top-stitching thread was just right for the kind of contrast I wanted with the machine quilting on the leaves. The rows are approximately an inch apart and although I marked out lines with taylor's chalk I was quite relaxed about following them so the stitching isn't dead straight, or at completely regular intervals. The half-inch binding is made of pieces of the Oakshott, varying in width between approximately 2.5 and 5 inches. I think the binding is my favourite bit! Thank you to Amy for hosting the Festival! 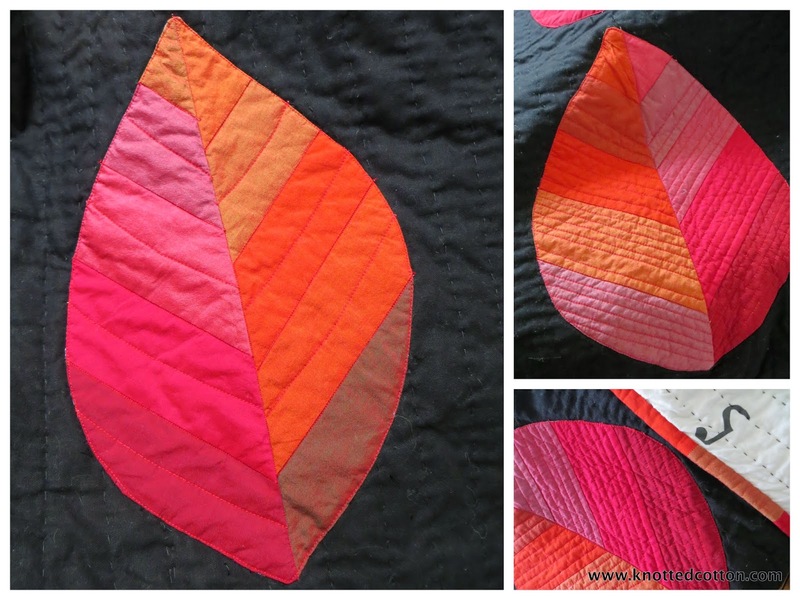 You can find Leaves in the Applique Quilts section. It's stunning! I like your idea to make all the leaves different, very creative. It's lovely to see the finished quilt. I love the hand stitching. Very impressive. So beautiful Catherine and just love seeing the contrast with the old building. it is amazing Catherine. So glad you worked it through and stuck with your ideas. It was so worth it! This has turned out so well - just lovely. It was fun watching it develop through the ups and downs. You must be very pleased. Congrats! Well done on the finish! I love how dramatic this quilt looks-it would make a fabulous wall hanging. I think the binding is always my favourite part of quilt making, and not just because it means the project is finished. Wow. The photos of this alone. What a great backdrop to photograph this against. And the backing was actually just as important as the top. It is funny to come in at the finished product and read that it was a couple of years in the making. That actually isn't too bad though. I have had some knitting projects take much longer. MUCH longer. this is lovely! The red against the black just makes it glow. Great use of Oakshotts! I think you captured your vision very well - the time spent paid off! It's nice to see your leaf quilt done and so beautifully too. I enjoyed seeing the progress. Some day I'm going to make my own leaf quilt but just haven't decided on a design yet. Love the shots outside against the gray building. It looks so fantastic Catherine! The colours glow so beautifully against the black. Love the contrast of hand and machine quilting too and the binding is just right. I know a lot of people seem to churn out quilts in a matter of weeks, but it's good to enjoy the process and what's the rush? This is such a great photo shoot to show off your wonderful quilt! The leaves really do glow. I love the hand quilting too, it adds a lovely texture. A beautiful quilt Catherine, and your hand stitching works so well. I have never sewed with Oakshott but would love to, the shimmer is gorgeous. This is such a stunning quilt, absolutely love it! Wow, Catherine, I just knew it would be fabulous. You have inspired me to get back to quilting again. I used to do a lot of it till my old bod started to protest. Simply.Incredible! OH MY! It may have taken you a long time to realize this dream but it was worth the wait!! Love Oakshotts and this is a most wonderful display!! It turned out amazing. Great work. Love the hand quilting and the colours, and, well, everything!! Absolutely stunning and well worth the wait! Cute!! Beautiful effect with the black fabric. See you soon in the Festival! This quilt is breathtaking! I love the leaves - and the colors you used are SO happy together! Thanks for participating so that everyone can share its beauty. This is stunning, Catherine! It's been amazing to watch the progress of this quilt. It turned out so well. Love the crinkle effect. Good luck in the festival! This is so beautiful! What a great use of that bundle!! This is awesome! Makes me want to try Oakshott too... Wonderful combination of colous, and the backing is just perfect for this. Love the binding - it is so cute! So beautiful! Really perfect Catherine. I like everything about your quilt. Simply beautiful. Great photography - first of all. Second, the quilt is so balanced and beautifully done. Catherine this quilt is absolutely gorgeous. You did an mazing job with the leaves and the quilting is so lovely. Good luck! I really love the way it turned out, you chose the perfect background fabric to highlight the beauty of the leaves. Hello Catherine, so glad you came out of the woodwork. I have not heard you wittering on about anything at this point, so your quilts are all new to me. I love the quilting on this one and the choice of the daring black! Great texture here, as well as palette & contrast.